The serratus posterior superior is almost to 100% involved if you have a painful shoulder. Learn how to massage it and get relief! Trigger points are painful when pressed on and are able to give you pain in areas of your body that might seem totally unrelated to the muscle that contains these points. The pain zones of this muscle can be pretty widespread among your body. Pain is mainly felt at the top of your shoulder blade and down the backside of your entire arm. Additionally this muscle can send pain to your chest, your inner upper arm, your forearm and to the back of your hand. Not shown but still possible areas of pain are your wrists and palms. The colour in the pictures below shows you how common it is to feel pain in the respective areas. 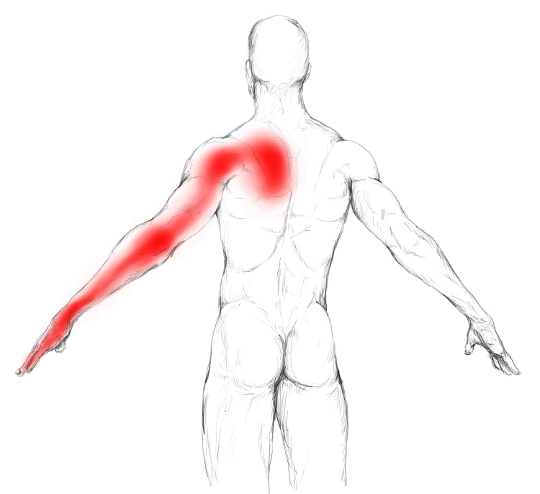 The darker the red, the more common it is to feel an ache at this spot when your serratus posterior superior contains trigger points. When lying on your back, your shoulder blade will be pressing on the muscle. If tender or trigger points are present, this can be pretty painful. The serratus posterior superior originates at the cervical and thoracic spine and attaches at the ribs under your shoulder blade. The X1 displays a common area for tender and trigger points to develop. It lifts the ribs and assists the diaphragm in breathing. It is easy as that. Muscles not always do complex things. Paradox breathing, which means breathing mainly with your chest instead of your diaphragm, will eventually overwork this muscle and create tender or trigger points. In general, the muscles that assist breathing ASSIST. They are not meant to be the main workhorses. It is just too much load for those small muscles. Also sitting in front of a high desk with your shoulders elevated will eventually lead to problems. The fibers of the muscles just draw near each other in this position. Such a condition, if it is present very often or chronically, is too much for the muscle. As the serratus posterior superior lies under your trapezius and rhomboids you are not able to feel it. Additionally the most troubling part that you want to massage, lies under the shoulder blade, so that you cannot access it directly with your hands. Still, with a little trick you will be able to massage it. Here you have two options. You may use a massage ball or the Trigger Fairy. Place the massage ball beside your shoulder blade approximately at the height of your spine of the scapula. Now move your arm over to the other side. This will rotate your shoulder blade in such a way that you can access the most common tender spots in this muscle. As soon as you encounter one, stop there and work it with slow and precise strokes. When does the Trigger Fairy makes sense? You have no blank space on the wall. It is too exhausting to massage yourself in a standing position. The massage with the ball is too intense. How to use the Trigger Fairy? 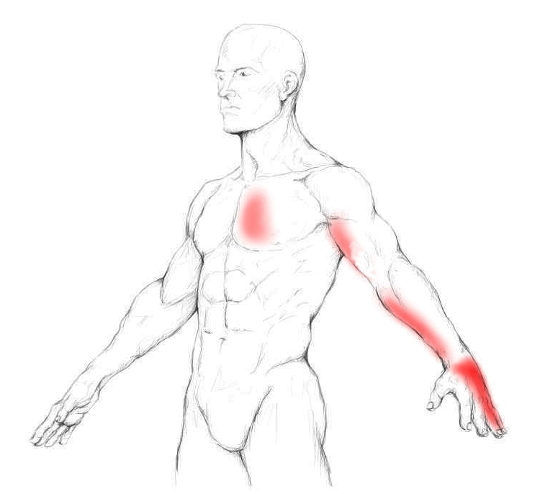 Cross the arm of the affected side in front of your body in order to get access to the muscle. Hold the Fairy with your other hand. Place it on the muscle and search for tender muscle knots. Massage each of them by pulling the Fairy forward and downward. You can also use circular motions. Stay on the point and take a few deep and slow breaths, concentrating on an elongated exhalation.